All thoughts and opinions, we shall not leave them at the door. We shall, instead, welcome them warmly... because that is the way to do it, my lovelies! Embrace the opinions!!! Are you wrapping up warmly for Christmas, and are you preparing the presents, mistletoe and candy canes? Well as you prepare, why not listen to a few winter-themed songs to warm you up a little more this festive season? So we're back with Yuka Ueno, though this time I will be reviewing the single release of Winter Kiss because really, why not? If I enjoy it, then I want to share it with you guys and let you know the wonders of her latest release! That, and I felt I needed to throw in at least one two actually single review for the 12 Days of Idols. It isn't fair to leave out a glorious b-side or two that accompanies the main A-side and its PV, right? That, and I fell in love with one of these two songs that is present on this beautiful single. It would have been such a shame to have not talked about them! So, with that all said and done, here is my single review of Yuka Ueno's beautiful second single, Winter Kiss. Are you ready? The first of the three songs, and the one we have previously been introduced to thanks to the PV that couples the song, Winter Kiss is a romantic and sweet sound that fits the vocals of Yuka perfectly. Here, she sounds quite husky during some parts of the song, and absolutely heavenly at other points. We hear so much more of what her voice is capable of in this song, amazing me as a listener even more. For a 15 year old, Yuka really knows how to work her voice to show us every aspect of it, from that low and husky tone to her sweet, higher voice that shows off the innocence and pureness of her vocals. She also has a lot of passion, emotion and power when she sings, allowing us to hear through the sound of her voice how much she enjoys and loves singing and performing the song that she has recorded. She is wonderful, a joy to hear. She is so talented, and I am so glad that I became a fan of her. A song like Winter Kiss just makes me love her even more as a performer and reminds me of how talented she is. Her voice reminds me of what some Idols may lack too, and really allows me to appreciate the passion and power within her voice as well as that pure talent that she has as a singer. As a song though, Winter Kiss is not a strong sound, but it is still a pretty good sound that allows Yuka to be flexible with how she sounds. It's still a beautiful track, one which is sweet and reminds me of the winter time, but it isn't the strongest on the single itself. It's still a great song though, and I think that Yuka did an amazing job. As I said before, she still manages to amaze me with her voice and passion, and I love Winter Kiss with a great deal, but it isn't the best on the track. This could have actually been a B-side, but I am still happy with it as an A-side. The second track on the single is Mirai Kanransha, which roughly translates to Future Ferris Wheel, and also my favourite track of the three present on the single. Why? Well, I find it entrancing, and I absolutely adore the sound of the instrumental and vocals from Yuka in this song. As a song, Mirai Kanransha sounds powerful, emotional and passionate, more than what Winter Kiss did as a song. It also sounds pretty romantic, which I like, and it has sounds in the background that remind me faintly of fairground rides or music that you hear when you go to a carnival or fair for the day. It is, in its own way, a beautifully nostalgic song that makes me think of childhood days out at the fair for birthdays, summer days out or spending time with my sister and parents. Through the instrumental though, I can hear a story about a romance, a date at the fair ground and a tinge of sadness behind both the instrumental and vocals. This may just be me as a listener feeling that way, but when I hear the instrumental at certain intervals, I can't help but think that there is a sadder story behind it, hinting at a broken heart of Yuka's side of the story, with the fairground being a place of reminiscing a lost romance, with wishes that one day, she will be able to go back in the future and ride the Ferris Wheel once again, as a happier person. It's a beautiful song, one that makes me feel sad but happy. Yuka gives a powerful, memorable performance her, her voice glorious, powerful and filled with emotion. She sounds amazing, as if the lyrics really do mean something to her, her voice heavenly and gorgeous. This is undoubtedly my favourite track on the entire single, and the one that I would have liked to have seen a PV for. I think that a PV based on the fairground with flashbacks, in the winter of course, would have been beautiful and appropriate. But, right now, I am just happy imagining a fantasy PV for this gorgeous song right now. It's all I can do. The third and final track of the single, Snow Drop is a more up-beat and sweet song compared to the previous two. It has an uplifting, airy melody to it that is cheerful and bright, demonstrating Yuka's vocals a little more by allowing her to experiment with high notes throughout the song. Whilst not the biggest fan of high notes sometimes, I am thankful that Yuka can at least hit them and still sound pretty nice. Snow Drop is a gorgeous song, one that I did not expect to be as up-tempo as it is, but it was a pleasant surprise to hear the sound of it for the first time, mostly because I was not expecting it. It's fun, fast-paced and beautiful, creating a lovely contrast to both Winter Kiss and Mirai Kanransha, which are both slower, more emotional songs that bring across a lot of expression and emotion. I am not saying that Snow Drop is emotionless, because it is far from it, but the song issues only one emotion, which is that of a more cheerful, laid back sound that makes you feel at ease as a listener. And, despite being named Snow Drop and most likely representing the winter weather condition, I find that the song reminds me of spring and the flowers under the same name as this songs title. Upon hearing it, I think of the countryside, walking through grass and relaxing on the porch in the sun whilst talking to friends or family. It is a homely song I think, one that reminds me of holidays, spending time in the countryside or relaxing at home during the breaks we have from work or school. It feels nostalgic, sweet and friendly, and is just a cheerful, bright song that is great to listen to. It my not be my favourite on the single, but it does come a very close second to Mirai Kanransha. It is a beautiful song, and I think that it is so uplifting and wonderful, so if you have the chance, be sure to give it a listen. 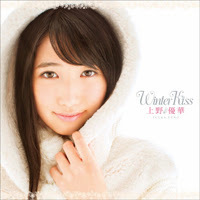 As a single, I find Winter Kiss to be another splendid, delightful release from the singing beauty that is Yuka Ueno. Once again she has delivered to us all a gorgeous single that contains three beautiful songs, each with their own theme and personality and all demonstrating how amazing her voice truly is. In each she sounds wonderful and tries various ways of singing to create a new atmosphere for each song, whilst still maintaining that emotional, powerful and passionate connection to the song through her voice. Just like her previous single, Kimi to Ita Sora, she has amazed me with her voice and pure talent. I find the entire single enjoyable, and whilst I find Winter Kiss itself to be the weakest of all three, the title track is still wonderful and enjoyable to listen to. With the other two tracks, the beautiful and nostalgic Mirai Kanransha and the homely, friendly sound of Snow Drop, I think that Yuka Ueno has created another amazing single that shows off her amazing talent and her pure, angelic voice. This single is so befitting of the winter, and I am in love with Yuka's voice even more thanks to the release of these songs. Powerful, beautiful and emotional, I can't get over how perfect Yuka's voice is to me as a listener. She truly is a talented individual, and she has an amazing future ahead of her as a performer and artist if her management continues to deliver her with amazing songs. Simply put, I am in love with this single and Yuka. It is amazing. 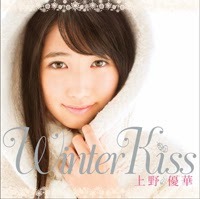 So what do you think of Yuka's latest single, Winter Kiss? Is it your flavour of Candy Cane, or don't you like this Christmas Present as much as I do?